Last night the Pittsburgh Penguins visited the New York Rangers. TERRIBLE VISIT! Henrik Lundqvist with the assistance of his mustached boys in blue defeated... sorry, CRUSHED the Penguins 5-1. For those of you who missed the game NO, Zatkoff was not in net. And yes, Pittsburgh was giving out free pucks all night long! The beginning of the game seemed promising. 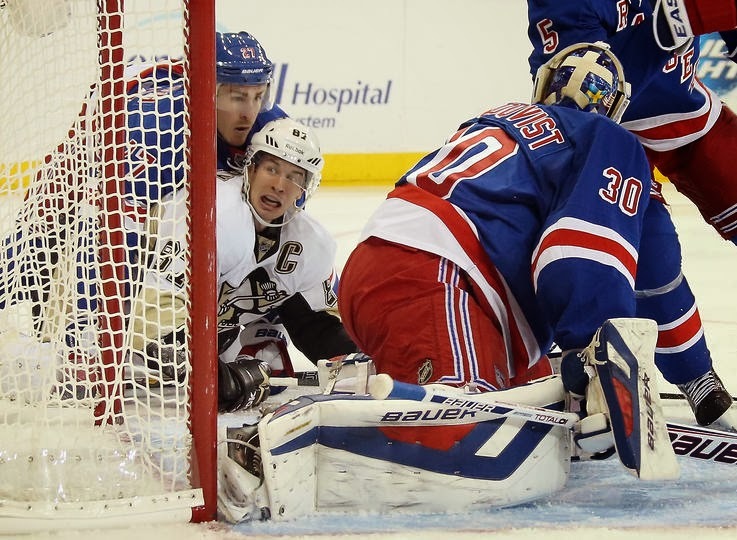 Right away Sidney Crosby effortlessly broke through the defenders and almost squeaked one past Lundqvist. Maybe this was a sign of our luck for the rest of the game? Niskanen would likely agree when later in the period he took a slap shot from the blue line that beat Lundqvist but sat on the line. The first goal of the game didn't come until 18:08 into the first. Ryan McDonagh assisted by Brian Boyle. A little over a minute later, Derek Stepan put a heavy wrist shot in the back of the net to get the Rags a 2-0 lead. The Rags came out with a stronger offense in the second period. The lead in the shot department 11-8. This was the Penguins weakest period as far as chances. Yet the still managed to help Henrik look sharp in goal for the most part. 13:10 seconds into the second Brian Boyle would get his second point of the night when he scored on Flower. This was arguably a weak looking goal not only because of a weak attempt by our blue line, but like the second goal it appeared Fleury just kinda threw his body towards the puck with no idea of where it was going. These things happen, no reason to explode over it. Don't get too excited, shortly after Ryan Callahan would score his 4th goal of the season, making it 4-1 for the Rags. 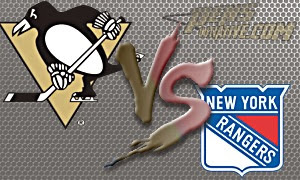 The third period had most of the attempts going to the Penguins who had the upper hand in shots 9-5 but again it was the Rangers who would score almost at the halfway mark of the period with a goal by Derick Brassard which would be the final goal of the game. Not many plus's to this game. Flower made 20 saves and Lundqvist stole the show. That seems to be the story for the Penguins. When we are doing poorly we are making a goalie look great. The Penguins now have a 11-5-0 record on the season and will play their next game in St Louis when they visit the Blues this Saturday. The Penguins were 1 for 6 on the Power Play but managed to keep the Rags goal less on their 4 Power Plays. The Penguins were %50 on faceoffs. Crosby had the same winning percentage. 17 giveaways for the Pens. I think that number is low... 0 by Kris Letang and 3 by Sidney Crosby. The Penguins blocked 10 shots. We learned that you can get blown away in a game without fighting all of the players on the other team. Paul Martin played 26:25 of the game. Letang played the second most minutes with 22:56. Giroux could learn a lot from this kind of focus. Follow me on the Twitter machine @ryannoble66.